Jean-Marie Gustave Le Clézio (French: [ʒɑ̃ maʁi ɡystav lə klezjo]; 13 April 1940), usually identified as J. M. G. Le Clézio, is a French writer and professor. The author of over forty works, he was awarded the 1963 Prix Renaudot for his novel Le Procès-Verbal and the 2008 Nobel Prize in Literature for his life's work, as an "author of new departures, poetic adventure and sensual ecstasy, explorer of a humanity beyond and below the reigning civilization". Le Clézio's mother was born in the French Riviera city of Nice, his father on the island of Mauritius (which was a British possession, but his father was ethnically Breton). Both his father's and his mother's ancestors were originally from Morbihan, on the south coast of Brittany. His paternal ancestor François Alexis Le Clézio fled France in 1798 and settled with his wife and daughter on Mauritius, which was then a French colony but would soon pass into British hands. The colonists were allowed to maintain their customs and use of the French language. Le Clézio has never lived in Mauritius for more than a few months at a time, but he has stated that he regards himself both as a Frenchman and a Mauritian. He has dual French and Mauritian citizenship (Mauritius gained independence in 1968) and calls Mauritius his "little fatherland". After several years spent in London and Bristol, he moved to the United States to work as a teacher. During 1967 he served as an aid worker as part of his national service in Thailand, but was quickly expelled from the country for protesting against child prostitution and sent to Mexico to finish his national service. From 1970 to 1974, he lived with the Embera-Wounaan tribe in Panama. He has been married since 1975 to Jémia, who is Moroccan, and has three daughters (one by his first marriage). Since the 1990s they have divided their residence between Albuquerque, Mauritius, and Nice. Le Clézio began writing at the age of seven; his first work was a book about the sea. He achieved success at the age of 23, when his first novel, Le Procès-Verbal (The Interrogation), was the Prix Renaudot and was shortlisted for the Prix Goncourt. Since then he has published more than thirty-six books, including short stories, novels, essays, two translations on the subject of Native American mythology, and several children's books. During the late 1970s, Le Clézio's style changed drastically; he abandoned experimentation, and the mood of his novels became less tormented as he used themes like childhood, adolescence, and traveling, which attracted a broader audience. In 1980, Le Clézio was the first winner of the newly created Grand Prix Paul Morand, awarded by the Académie Française, for his novel Désert. In 1994, a survey conducted by the French literary magazine Lire showed that 13 percent of the readers considered him to be the greatest living French language writer. The Nobel Prize in Literature for 2008 went to Le Clézio for works characterized by the Swedish Academy as being "poetic adventure and sensual ecstasy" and for being focused on the environment, especially the desert. The Swedish Academy, in announcing the award, called Le Clézio an "author of new departures, poetic adventure and sensual ecstasy, explorer of a humanity beyond and below the reigning civilization." Le Clézio used his Nobel prize acceptance lecture to attack the subject of information poverty. The title of his lecture was Dans la forêt des paradoxes ("In the forest of paradoxes"), a title he attributed to Stig Dagerman. ^ a b "The Nobel Prize in Literature 2008". Nobelprize.org. Retrieved 2008-10-09. ^ a b Bremner, Charles (9 October 2008). "Jean-Marie Gustave Le Clezio wins the 2008 Nobel Literature Prize". London: Times Online. Retrieved 2008-10-09. Le Clézio, who was born in Nice and has lived in England, New Mexico and South Korea, said that he was touched by the honour. He mentioned his British father, a surgeon, and his childhood in Mauritius and Nigeria. "I was born of a mix, like many people currently in Europe," he said. ^ della Fazia Amoia, Alba; Alba Amoia; Bettina Liebowitz (2009). Multicultural Writers Since 1945. Westport, Connecticut: Greenwood Publishing Group. pp. 313–318. ISBN 978-0-313-30688-4. ^ "Jean-Marie Gustave Le Clézio wins Nobel Prize". University of Bristol. 10 October 2008. Retrieved 2008-11-07. ^ Pollard, Niklas; Estelle Shirbon (9 October 2008). "Nomadic writer wins Nobel prize". International Herald Tribune. Retrieved 2008-10-09. ^ Lee Esther (2 January 2008). "Acclaimed French author praises Korean literature". JoongAng Daily. ^ Yonhap News (9 October 2008). 한국과 각별한 인연 가진 르클레지오 (in Korean). Dong-a Ilbo. Archived from the original on 11 December 2008. ^ Tahourdin, Adrian (21 April 2006). "A Frenchman and a geographer". 5th paragraph. London: review is taken from the TLS. Retrieved 9 December 2008. "Le Clezio received the Academie Francaise's Grand Prix Paul Morand in 1980 for Desert, a novel that revealed a move towards a more expansive and lyrical style. The book has a dual narrative. The first, dated 1909–10, chronicles the tragic fate of a Tuareg clan fleeing across Morocco from their French and Spanish colonial oppressors ("les chrétiens")". ^ Thompson, Bob (9 October 2008). "France's Le Clézio Wins Nobel Literature Prize". The Washington Post. Retrieved 2008-10-09. ^ Lea, Richard (8 December 2008). "Le Clézio uses Nobel lecture to attack information poverty". London: guardian.co.uk home. Retrieved 14 December 2008. 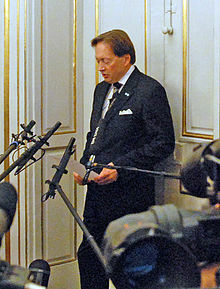 ^ The Nobel Foundation 2008 (7 December 2008). "The Nobel Foundation 2008". Nobel Lecture. The Nobel Foundation 2008. Retrieved 11 December 2008. ^ JMG Le Clézio (2014-07-24). "Foyer de l'horreur au Mexique : plaidoyer pour " Mama Rosa " par JMG Le Clézio". Le Monde. ^ "Prix Jean Giono" (in French). Fondation Pierre Bergé – Yves Saint Laurent. 2009. Archived from the original on 5 January 2009. Retrieved 2009-02-16. "Grand Prix Jean Giono". Prix littéraires. 2009. Retrieved 2009-02-16. ^ "Ljusgestalt i ondskans tid". SvD (in Swedish). 24 October 2008. Retrieved 27 October 2012. ^ "Fransman får Stig Dagermanpriset". gd.se (in Swedish). 4 June 2008. Retrieved 27 October 2012. ^ "Décret du 31 décembre 2008 portant promotion et nomination". JORF. 2009 (1): 15. 1 January 2009. PREX0828237D. Retrieved 2009-04-05. ^ "Ordre national du Mérite Décret du 14 novembre 1996 portant promotion et". JORF. 1996 (266): 16667. 15 November 1996. PREX9612403D. Retrieved 2009-04-05. This page was last edited on 7 January 2019, at 14:53 (UTC).